Spellirium | Untold Entertainment Inc.
i was delighted to be invited to take part in the WordPlay festival this past weekend, which celebrated the intersection of video games and literature. The afternoon-long festival was held at the Toronto Reference Library, and was organized by Jim Munroe of the Hand Eye Society. Of course, i was there repping Spellirium, Untold’s “comedy trashpunk adventure game” in full game-promoting regalia. Photo by Stephen Reese. Conjuctivitis by Poofingers McEyeballpoker. My Spellirium shill get-up is meant to be vaguely reminiscent of the game’s Vendor character, who you don’t actually meet until you’re a solid hour and a half into it, so connection is lost on most people. Also lost on most people (thankfully) was the fact that i had been sick as balls all week, and barely managed to drag myself with one arm up the street to the library. i slumped home after the festival to continue hallucinating and writhing around on my bed in a cold sweat with an increasingly alarming case of pinkeye. Yours truly, a mere four hours later. Ask me about Spellirium. Spellirium favours no age. This kid rocked the game harder than most adult players. It was delightful to be in a room where games like the interactive fiction title Lost Pig were being showcased, and where story-based games like Kentucky Route Zero were inexplicably being played on the Oculus Rift (we gave it a shot with Spellirium, but it didn’t pan out). i actually got into conversations with people about Twine, Inform7, Andrew Plotkin, and my recent purchase of a bluetooth keyboard for my iPad so that i could play IF games. Birds of a feather flock together, and it was wonderful to have a place for us to flock. i hope we see more events like WordPlay in the future. This entry was posted in Blog and tagged Spellirium on November 18, 2013 by Ryan Henson Creighton. Spellirium is a lot of fun for word nerds, but certain types of games just don’t show well at conventions, where a million screens and flashing lights are competing for attention. Since the game is pretty static and requires concentration and thought (heaven forbid! ), putting Spellirium on a big screen places the game at a disadvantage. The answer was to create an eye-catching and fast-moving trailer for Spellirium, and to loop it on the big screen, while players try out the game on a smaller laptop while sitting plaintively at the table. i’m not a huge Apple fan, largely due to the shackles the company puts on its devices and software. As of this writing, the iPad can’t loop video. i spent at least two shows pressing the PLAY button every minute and ten seconds like a chump. Luckily – and predictably – there’s an app for that. i use LOOPYLOOPY from Osamu Design to save myself from having to check in with the device as if i’m stuck in the LOST hatch. Oh, fek. The convention centre is going to explode again, isn’t it? When every other booth is blasting fresh jams, even an eye-catching trailer won’t cut it. Much to the chagrin of my neighbouring exhibitors, i have to crank the volume on the teevee to blast Blackbird Raum’s Honey in the Hair, the backing track to Spellirium’s trailer, in order to complete my attract mode. i love the song to bits and pieces, but by now, i’ve probably heard it more often than the band themselves … 1:10 on repeat for days on end. Anything for my art. i love you guys, but … DAMN. The easiest way to make money is to ask for it. If people aren’t aware there’s something to buy, they’re quite unlikely to buy it. Make an attractive sign with a price on it and feature it prominently. At PAX, the $15 price tag for the Spellirium alpha was front-and-center on the inside lid of my cigar box. In City Slickers, Billy Crystal’s character has an existential crisis when he realizes that as an ad salesman for a radio station, he sells nothing. At a conference, it’s much easier to sell people a tangible thing that they can hold and cuddle, instead of a cold unfeeling game code on a card or sticker. Spellirium codes are contained within this baby cow. Please take one. i rolled my game codes up and stuck them into cool little glass bottles with corks, and then attached Spellirium labels to them with ribbon. The red ribbon denotes a PC code, while white denotes Mac. The paper inside contains fulfilment instructions, and a support address in case anything goes sideways. At PAX, i vended these codes from the little cigar box on my chest. They drew a lot of interest, and we nearly sold out of them. At ConBravo, i decided to dress up like one of the characters in Spellirium. The game has a “trashpunk” aesthetic, and villagers dress up in garbage, so i decided to follow suit. i had a bubble wrap vest with an extension cord for a belt, two bike tires criss-crossed on my chest and a soda bottle hat. Not knowing anything about the game, no one knew what i was trying to accomplish, and i didn’t look like anyone you’d want to have a conversation with. Also, plastic costume components on a sweaty fat guy are never a good plan. 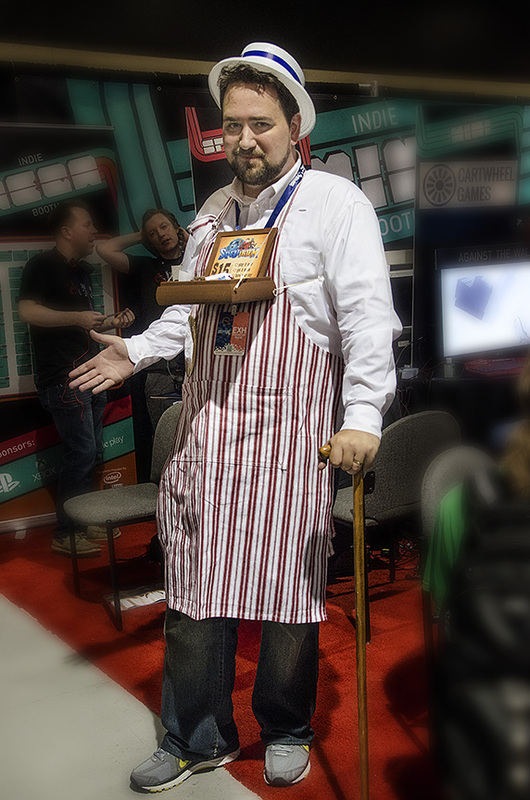 The mom n’ pop apron/cigar box/boater hat combination that i wore to PAX was friendly and relatable. It was clear that i was trying to sell something, so people who approached me were prepared to hear my pitch. And what i was selling was probably something fun, like ice cream, candy or bread. This all worked in my favour. i really want to build that popcorn cart at some point. The costume was meant to be reminiscent of the Vendor character from Spellirium. In the future, it might be nice to add a few metallic trashpunk elements to the get-up, but the outfit worked so well at PAX that i don’t even think it needs tweaking. Uh … yeah. i’m going to stop blogging and get right on that. This entry was posted in Blog and tagged Spellirium on September 5, 2013 by Ryan Henson Creighton. This entry was posted in Blog and tagged Spellirium on June 19, 2013 by Ryan Henson Creighton. November through January, in both 2012 and 2013, were rough times for me. Those same three months, a year apart, had me crunching harder than the breakfast cereal Cap’n. Wake up (barely) at 10 or 11am. Open the laptop next to the bed. Work from bed. No shower, no breakfast … just work. Loving wife feeds me and the family lunch. Work. Possibly relocate to the living room. Loving wife feeds me and the family dinner. Work. Possibly relocate back to bed. i wouldn’t leave the house for days on end. i think my record was ten days inside the house. i put on a lot of weight. i pictured it all ending like that Geraldo episode where they remove the side of the house to transport Hambone to the hospital via crane and flatbed truck. This was all in service of a government deadline for my game Spellirium, a project which had gone terribly terribly wrong by its fourth month of production, and had stayed wrong for the ensuing three years. Needless to say, developing in isolation like that is not a Good Thing™. One of the biggest benefits of agile development is getting your creation out in front of playtesters early and often. But when you’re stuck at home Hamboning yourself with an impossibly-scoped game and no team or budget to speak of, important things like Finding the Fun fall by the wayside. i warsh mahself with a rag on a stick. That’s why the spellcasting system in Spellirium ended up like it did: bloated, ineffective, and tough to love … much like its developer. This week’s Spellirium Minute developer diary outlines the problems in the system that became obvious once it saw the light of day (which was approximately the same time i – quite literally – saw the light of day). The good news in all of this is that, thanks to the kickender, the problems with Spellirium have been exposed. When i launched the campaign with the alpha version, i joked that it was like letting a bunch of people into your bedroom without first being able to tidy it up or hide the embarrassing bits. But i’ve had a really positive, helpful response from the community. Every Spellirium backer is automatically signed up for an account on our bug-tracking system, and i’m happy to give people an extra “Playtester” credit if they log a bug or two. The players’ feedback has been extremely valuable to me, and i’ve spent the last few weeks fixing design issues, addressing their bug reports, and preparing Spellirium for a solid 0.37 release. Lately, i’ve taken up running. i’ve also given up drinking soda pop, which once sounded a death knell for an already-overweight guy like me with such a sedentary lifestyle. My “You Get Fat” campaign sees me donating any and all sugary beverages to friends, family and office mates, passing the calories on to them so that i don’t ingest them. In this way, i’m slowly relying on other people, making changes little by little, and am now on the right track to professional and personal improvement. In this way, i hold out great hope that both my game and my life will get better and better. Spellirium recently achieved its first crowdfunding goal – Pretty Decent Voiceover. You can contribute to goal #2, Act III Adequately Animated, at the Spellirium kickender site. This entry was posted in Blog and tagged Spellirium on May 31, 2013 by Ryan Henson Creighton.